C. T. K. Chari (5 June 1909 – 5 January 1993) was Head of the Department of Philosophy at Madras Christian College from 1958 to 1969 and the most prominent among contemporary Indian philosophers who paid close attention to psi phenomena. Chari published extensively on extremely diverse topics, such as logic, linguistics, information theory, mathematics, quantum physics, philosophy of mind, and, of course, psi research. 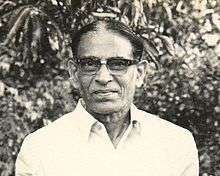 Cadambur Tiruvenkatachari Krishnamachari (CTK) was born on 5 June 1909 in Tiruvellore, South India. He was the third son of Tiruvenkatachari and Padmammal. He had two older brothers - C.T.Rajagopal, a noted mathematician, and C.T.Venugopal. They had a young sister - Kamala. They were grand nephews and niece of the illustrious brothers - Sir.P.Rajagopalachari KCSI, CIE and P.Narasimhachari - Justice in High Court of Burma (Myanmar). CTK and his family lived in Triplicane (Chennai) on Big Street and all of them studied in Hindu Higher secondary school. He did his intermediate in Presidency College, Chennai. Following the two years in the intermediate college, he got his BA (Honors) from Madras Christian College (MCC) and distinguished himself by also winning the Samuel Sathyanathan Gold medal for Philosophy. He then became a tutor and lecturer at American College, Madurai. In 1940, he joined MCC as an assistant professor. CTK was contributing scholarly articles to scientific magazines and journals even before he got his doctorate or before becoming a professor at MCC. His first paper – ‘An Epistemological approach to the special theory of relativity' was published by Mind in April 1937. Towards the end of 1952 he started to work on his doctoral thesis - 'On some spatial representations of time and their significance for problem of precognition'. His supervisor was Professor Parthasarathy (Major) and in 1953, his thesis was sent to a board of three judges that included Sir Karl Popper at University of London. He was awarded his PhD with top honors, something that was widely expected. At the same time the University allowed him to convert his BA (Honors) degree to be an MA degree. By 1958, he was appointed the Head of the Department of Philosophy. From then to his retirement in 1969, he and his family lived at Staff Bungalow 15 (behind Bishop Heber Hall) on the Madras Christian College Campus at Tambaram. Following his retirement, he continued as a (University Grants Commission) professor until 1976. He also was the acting head of the department of Philosophy until 1971. The family moved outside the college campus to a house which they called 'The Cloister' where CTK and Mythili lived out the remainder of their lives. In 1955, Gardner Murphy visited Dr. Chari at the request of Eileen Garrett - a medium and one of the founding members of the Parapsychology Foundation, after which Dr. Chari became a regular contributor to various parapsychological magazines. He had a long and engaged battle  of wits with Ian Stevenson who studied reincarnation across South East Asia and published a lot of cases favoring the phenomenon. CTK was skeptical, and questioned Dr. Stevenson's research in the Journal for American Society of Psychical Research. He similarly discussed the research and views of Dr. B. V. Raman, who was the founder of the Indian Astrological magazine. In the 1980s, he slowly wound down his research activities, though his correspondence with various scholars continued to the very end. His last contribution was a paper titled 'Paranormal Religious Thanthology' to Christian Parapsychologist in March 1992. Mythili died in Jan 1992 and CTK died within a year in Jan 1993. ↑ Braybrooke, Marcus. "A Wider Vision: A History of the World Congress of Faiths, 1936 - 1996". ↑ "London Gazette notice" (PDF). ↑ Chari, C.T.Krishnama (Oct 1938). "An Epistemological Approach to the Special Theory of Relativity". Mind - New series. 188. 47: 550–552. doi:10.1093/mind/xlvii.188.550. ↑ Chari, C.T.Krishnama (26 Sep 1963). "Time Reversal, Information Theory, and "World-Geometry"". The Journal of Philosophy. 60 (20): 579–583. ↑ Chari, C.T.Krishnama (Apr 1949). "On Representations of Time as "The Fourth Dimension" and their Metaphysical Inadequacy". Mind. 58 (230): 218–221. doi:10.1093/mind/lviii.230.218. ↑ Chari, C.T.Krishnama (Feb 1958). "On the 'Space' and 'Time' of Hallucinations". The British Journal for the Philosophy of science. 8 (32): 302–306. doi:10.1093/bjps/viii.32.302. ↑ Chari, C.T.Krishnama (Aug 1957). "A Note on Multi-Dimensional Time". The British Journal for the Philosophy of Science. 8 (30): 155–158. doi:10.1093/bjps/viii.30.155. ↑ Chari, C.T.Krishnama (May 1971). "Towards Generalized Probabilities in Quantum Mechanics". Synthese. 22 (3/4): 438–447. doi:10.1007/bf00413438. ↑ Chari, C.T.Krishnama (Apr 1955). "Quantum Physics and East - West Rapprochement". Philosophy East and West. 5 (1): 61–67. doi:10.2307/1397109. ↑ Chari, C.T.Krishnama (1967). "Critical review of Stevenson's Twenty Cases". ↑ "Correspondence with Ian Stevenson". ↑ Stevenson, Ian (1986). "Reply to C.T.K.Chari". Journal of the Society for Psychical Research. 53: 474–475. ↑ Rao, Ramakrishna. "Tribute for C.T.Krishnama Chari" (PDF). Journal of Society for Psychical Research.